"Exactly 30 years now went by since the last time any Hailu Mergia's original material was released. In the past few years the reissues of his old recordings brought him back to the scene allowing a wider audience to discover his great music. 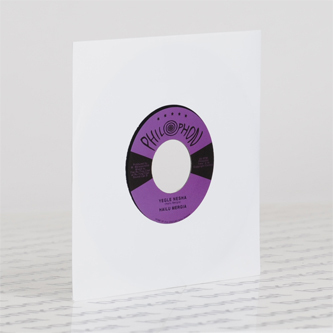 The combination of african roots and western influences gave his music a unique touch which is again the strenght and charm of the two new tracks released on this 7" for Philophon. A wave of elegant melodies will hit your ears while your body won't stop be driven insane by the polyrhythmic funky beats. The songs were recorded in Berlin at Philophon's studio, run by the german drummer and producer Max Weissenfeldt (Poets of Rhythm, Whitefield Brothers, also known for his collaborations with Dan Auerbach and Dr. John). This 45rpm gem perfectly reflects the aim of the label: to put on vinyl something precious that will make you forget time and space and leave you alone with what really matters: awesome music."